Long: E 174º 53' 39" Lat: S 36º 53' 43"
On Sept 16, 2009 I stumbled upon a new asteroid, ~19.5, moving through Aquarius. Some of the story can be found here Eastern Courier. 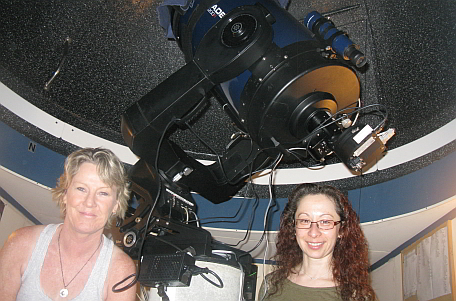 Farm Cove Observatory (FCO) is a privately owned and operated observatory conducting astronomical research for the Centre for Backyard Astrophysics (CBA), Microlensing Follow Up Network (MicroFUN) at The Ohio State University Astronomy Department and regular comet and asteroid astrometry. FCO was built in 1999 and sits on the western side of the Wakaaranga reserve which is a tributary of the Tamaki River. 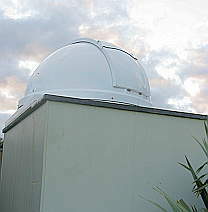 The observatory gets its name from Farm Cove, an eastern suburb of Auckland, New Zealand some 25kms from the heart of the Auckland city centre. Auckland boasts three harbours, two mountain ranges, 48 volcanic cones and more than 50 islands. It has a population of approximately 1.3 million and is ever increasing. Stella Kafka the new Director of the American Association of Variable Star Observers (AAVSO) was in New Zealand for the 50th Year celebration of Mt John Observatory and to attend the Royal Astronomical Society of New Zealands annual conference held in Lake Tekapo during the first week of May. Stella gave a number of inspiring talks to both professional and amateur astronomers during her visit to New Zealand . She would like to encourage those interested in variable star observation to take a look at what the AAVSO has to offer. If you are wanting to get started in variable star observing but not quite sure how to go about it, the AAVSO offers mentor programmes and online tutorials to all their members. It was lovely to have her take time out of her busy schedule to visit the observatory at Farm Cove.